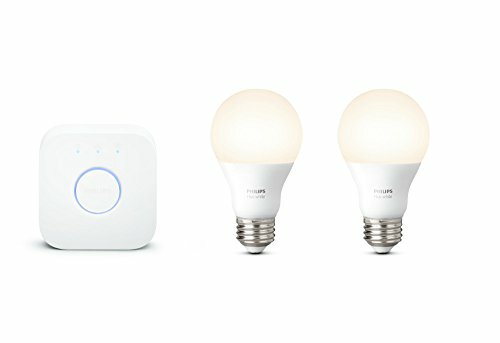 Combining energy efficiency with intuitive controls the Philips Hue White A19 Smart 2-Bulb Starter Kit changes the way you control and experience light at home. Security and comfort using the Philips Hue app to set lighting schedules, dim or turn your lights on and off from anywhere and ensure you never come home to a dark house. Schedule lights to turn on before you arrive home from work or turn off/on while on vacation for added security. With everything you need to get started, this kit comes with two dimmable Philips Hue White A19 60W Energy Star Certified LED Smart bulbs, able to fit most lamps and overhead lights, and the Philips Hue Bridge that can reliably control up to 50 lights without slowing your WiFi. To install, simply screw in the smart bulbs into your desired light location, download the Philips Hue app (free on iOS and Android), and use the in-app guide to set up your Hue bridge. Easily expand your smart lighting system with Hue accessories (sold separately), such as a Hue Dimmer Switch, Hue Tap, or Hue Motion Sensor. Control your Philips Hue lights with your voice using Amazon Alexa, Apple HomeKit, or Google Assistant. Pair it for automation with your existing Nest or Samsung SmartThings system. Each kit includes two dimmable Philips Hue White A19 60W Energy Star Certified LED Smart bulbs a Hue Bridge, ethernet cable, power adapter, manual, and three-year warranty. Enhance your home with soft white lighting, controlled remotely wherever you are. Automate your lighting experience with the Philips Hue App, and ensure you never come home to a dark house. Control your Philips Hue lights with your voice using Alexa, Apple HomeKit, or Google Assistant. Pair it for home automation with your existing Nest or Samsung SmartThings system.